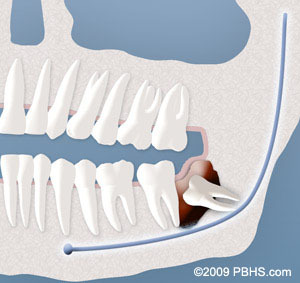 Why Wisdom Teeth Removal? 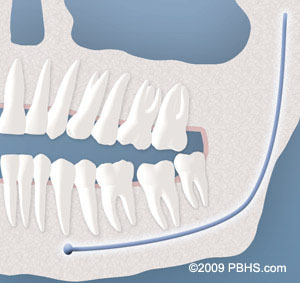 | What Happens If I Don’t Have My Wisdom Teeth Removed? | What Happens the Day of Removal Surgery? | What Happens After Removal Surgery? Non-infectious diseases may also arise in association with an impacted wisdom tooth. Cysts are fluid-filled “balloons” inside the jaw bone that develop as a result of impacted teeth and slowly expand destroying adjacent jawbone and occasionally teeth. They can be very difficult to treat if your wisdom teeth are not removed in your teenage years. Although rare, tumors can be associated with the delayed removal of wisdom teeth. What Happens Afterwards — What Will I Feel Like? Once the local anesthesia wears off, you may require prescription pain medication. Please try non-narcotic anti-inflammatory medications such as ibuprofen (Advil®) first, to see if that adequately treats your pain. If not, begin your other prescription pain medication. For more information, please refer to the post-surgery instructions for wisdom teeth removal. If you need assistance, please call our office: NRV Oral & Maxillofacial Surgery Blacksburg Office Phone Number 540-951-8777 (Blacksburg) or NRV Oral & Maxillofacial Surgery Radford Office Phone Number 540-633-5700 (Radford). 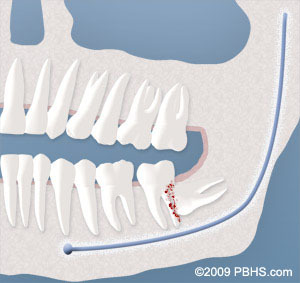 The local anesthesia may last until the following day, and should not be confused with an injury to your nerve. We recommend starting your post-operative diet with clear liquids such as jello and broths, gradually increasing in substance as your body permits. This testimonials section is in progress. Please visit the Patient Review Form page to leave a review about your wisdom teeth removal experience with this practice. Call our office if you would like more information: NRV Oral & Maxillofacial Surgery Blacksburg Office Phone Number 540-951-8777 (Blacksburg) or NRV Oral & Maxillofacial Surgery Radford Office Phone Number 540-633-5700 (Radford). NRV Oral & Maxillofacial Surgery, Ltd.
Dr. VanGilder and his team were amazing-coming from someone who has had horrible experiences with a dentist and is terrified of dental work that means a lot!